Well, it’s finally here. The last cake of the official heavenly cake bakers project. Despite the weekend* we had around here, I just didn’t feel right missing out on baking this one with the rest of my baking buddies. We picked up some black currant herbal tea at Teaopia. The rest of the ingredients were easy: chocolate, cream and regular pantry items. The cake has a lot of components, but none struck me as particularly challenging (ok, my arm got a bit tired with the Sabayon). I tried to clean up the dishes as I went, but by the end of it, I still had just about a full load in the dishwasher, and several big bowls on the counter. Oh well. Let’s bake! I still am amazed every time I beat yolks to the “ribbon stage”. Yeah, I know the machine’s doing the work, so I should get over it! Whites, I’d like you to meet my friend here, chocolatey yolks. Next up is the Sabayon. Like I said, I used this black currant tea. It claims to include “the traditional base of hibiscus, apple pieces, and rose-hip peel with the addition of elderberries, black currant leaves, black currants and vanilla flavour.” It was very flavourful. I was amazed at what the 1/4 cup of tea did to the flavour of the Sabayon. 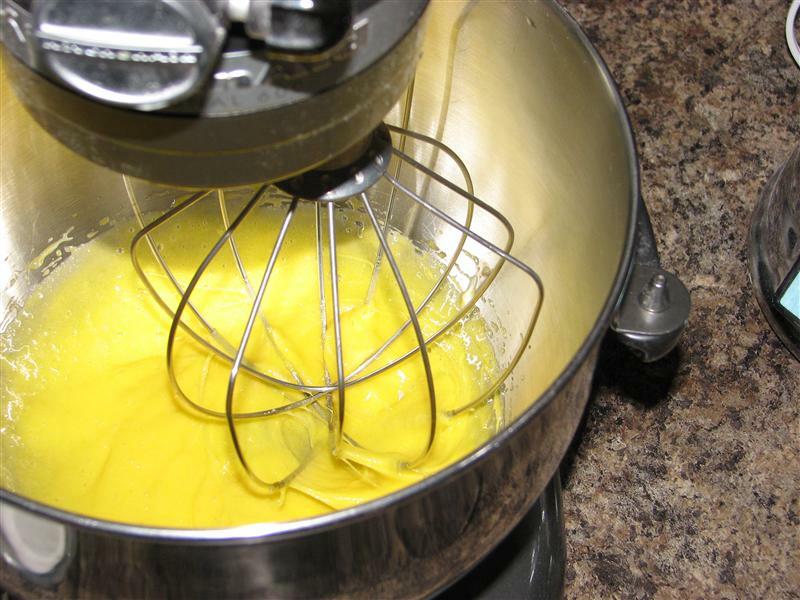 Unfortunately, I neglected to get process pictures, because I was too busy whisking. Once the Sabayon is finished and cooled, we’ll mix it into a chocolate mousse. 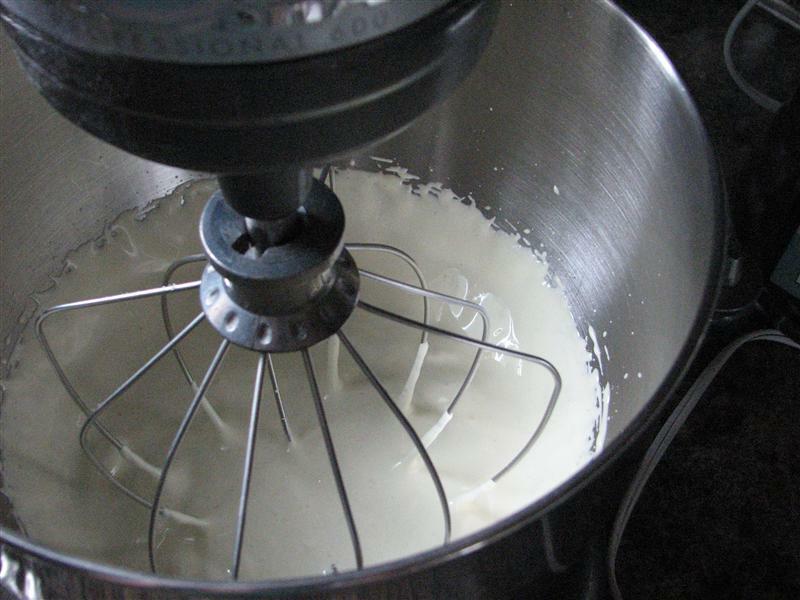 Start by whipping cream. Oh… actually, start by pureeing blackberries, and straining them. That was messy, so I didn’t pick up the camera until it was done. Then mix some gelatin into the blackberry puree, and wash your purple hands. Then melt some chocolate (ganache, because it has cream added), and THEN start whipping your cream. …then the raspberry, then gently fold in the Sabayon, and pour that into your mold (or plastic IKEA mixing bowl, since that’s the only thing I had that actually had a round inner bottom). Top with a round of the cake from waaaay earlier. Stash the whole thing in the freezer for 8 hours. Or until after work the next day. Then make the glaze. The glaze takes a while to cool, so I spent the time unmolding my “la bomba”. It turns out the lid for the IKEA bowl is almost exactly the same size as the top (bottom!) of the cake, so I just basically flipped the bowl upside-down and pulled the bowl off the top after manipulating it a bit. I love how I can see the reflection of our backsplash on the top of the cake. I had myself a small slice of this tonight, just so I could include my feedback in this post. I was frankly shocked at how much the berry flavour came through, especially in the parts of my piece that were thawed. It was delicious. I’m guessing the flavour was a function of the tea I used, and the fact that it wasn’t black tea, so contributed nothing to the potential bitterness of the chocolate. I just hope all that chocolate doesn’t keep me awake tonight! I would be interested in trying to use this basic recipe, minus the bottom crust and top glaze, just as a mousse/pudding type dessert in custard cups or sundae glasses. I think that would simplify the process/timeline (and maybe even the number of dishes) significantly. *What weekend? Well, on Friday night, my husband tore his calf muscle at soccer practice. At first he thought it was a bad cramp, but based on the state of his mobility Saturday morning, we thought we’d better get it looked at. So, we spent most of the day Saturday in the ER, and a couple of hours on Sunday at the hospital again, getting an ultrasound done on the muscle and waiting for results. The treatment is to stay off it for a week, and he has a referral to physio. I feel lucky to live in a country where all we have to pay for that is $20 for the crutches, and that will be reimbursed through work. Then, of course, on the way home yesterday, I got hit with a migraine and was flat out on the couch for a couple of hours, before I managed to feel well enough to start baking. Posted on May 16, 2011 by KristinaPosted in BakingTagged black currant, blackberry, chocolate, heavenly cakes, mousse. It looks great–you really have the mirror shine, and did a lot better than I did with the reflections in the photograph. I really didn’t get much berry flavor from mine–maybe the Teopia tea really helped yours (I had a black tea/blackcurrant blend). I did have the same thought about just serving the mousse. It is great stuff! Great La bomba! Looks fantastic. This was a fun recipe – glad you enjoyed it. It looks beautiful – great shine. I have made it twice now and plan to serve it again for a special dinner in June. The sabayon does take longer than Rose mentions in the book though. So shiny–it looks great! 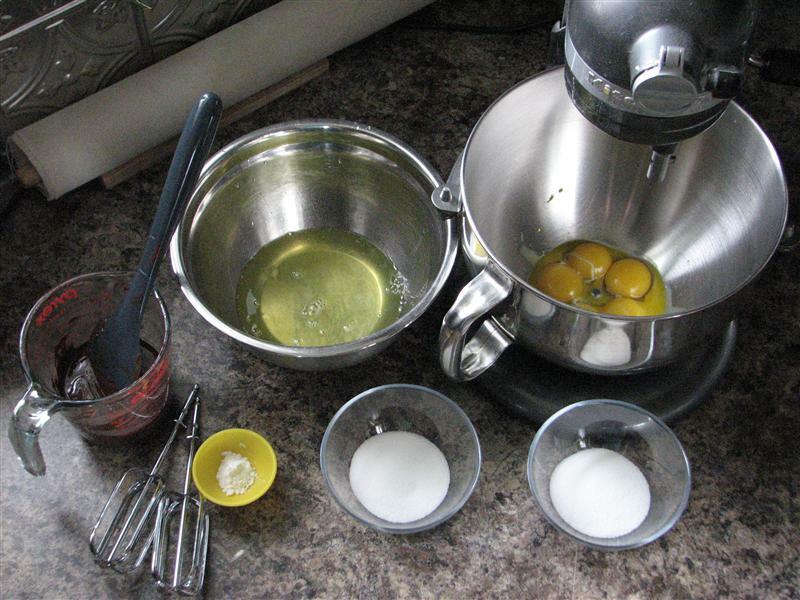 Great process pics–I am also in love with yolks at the ribbon stage. Glad you’ll still be baking along! Oh wow..so shiny and gorgeous! That is one great La Bomba! Sorry to hear about your husband! I hope he’s feeling better. Kudos to you for baking through that and the migraine. Your bomba looks great. And 19 more cakes WOHO!! I also have a couple that I’ve baked but haven’t posted (that’ll go into free choice :)). I want to tell you that for the HCB continuation, if you already bake the Barcelona Brownie Bars, you can make something else from your list, and it will count (will be included in the LC NC). Please do provide the link to your Brownie in your post though, so we can check it out. What a gréat post. I have been in dread fear of this récipé, although i did purhase thé round blue Lekue mold i think Zack used. Your bombe looks spectacular and am certain it tasted thé same. I Will now take thé plunge.